Pasta Checca with Burrata! This recipe is ready in less than 20 minutes. 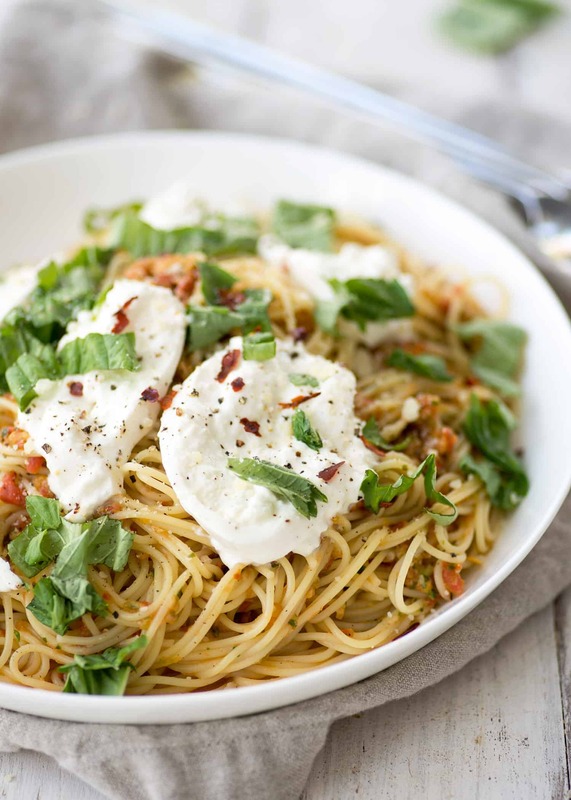 Quick, no-cook sauce tossed with hot angel hair pasta and topped with creamy burrata. This recipe is sponsored by Dreamfields Pasta. Thanks for supporting the brands that make DK possible. We leave for Italy TOMORROW! Yes, tomorrow. The trip that my mom and I have been dreaming and planning about for months is finally happening and I can’t.freaking.wait. We all know how I feel about The Motherland Italy; I wrote an entire cookbook celebrating my love for the food, people and cultural traditions. I’ll be documenting our travels and eats on Instagram, so make sure to follow along for copious amounts of pasta, wine and gelato in your feed. It’s then only fitting that I’m sharing with you one of my favorite recipes from my new cookbook, inspired by our last trip to Florence. 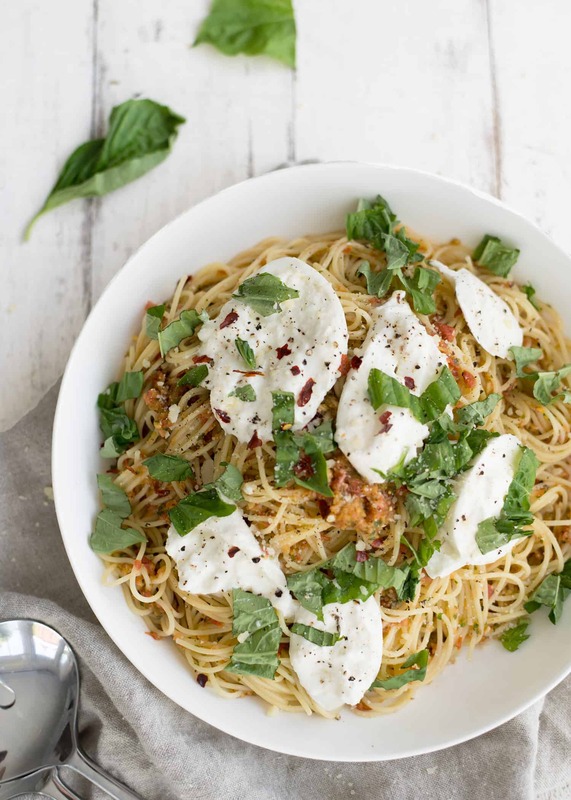 Pasta Checca with Burrata; a lazy girls dream answer to what’s for dinner. Even though it’s October, my tomato garden is still over-flowing with bright red bulbs. This is the first year that we’ve actually had a real garden (not one in containers) and I’m shocked by how healthy our tomato plants still look. If they want to keep giving me juicy tomatoes well into Fall, then so be it. Maybe my little plants have a bit of Italian in them as well. Pasta Checca is the fancy term for no-cook tomato sauce. Throw everything in a food processor; pulse until chunky, then toss with hot pasta. The steam from the pasta barely cooks the sauce, creating a light, tangy marinara that’s ready in less than 15 minutes. You could stop there, but I had a similar dish in Florence a few years ago that was dolloped with burrata cheese. What’s that saying? Once you go burrata, you can never go back? Er, something like that. Melty, creamy burrata tossed with this simple tomato sauce might be the best thing to happen to pasta in a long time. October is National Pasta Month – or as my friends at Dreamfields likes to call it, #HealthyPastaMonth. Pasta forever. 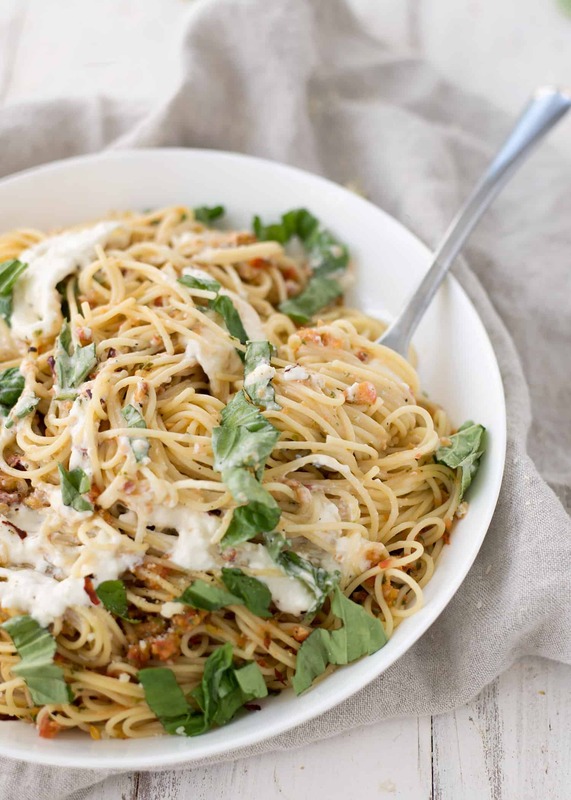 To celebrate, Dreamfields rounded up 31 bloggers to share their favorite pasta recipe. 31 pasta recipes! That’s one for everyday of the month; which is the perfect pasta ratio if you ask me. I really can’t get enough of Dreamfields pasta; I love that it has the taste and al dente texture of traditional pasta, with 5g of fiber and 7g of protein. It’s the perfect win-win for those of us who love the taste of white flour pasta and the nutrient content of the whole-wheat stuff. Their pasta is so fantastic, I even mentioned them in my cookbook as a favorite pasta brand. 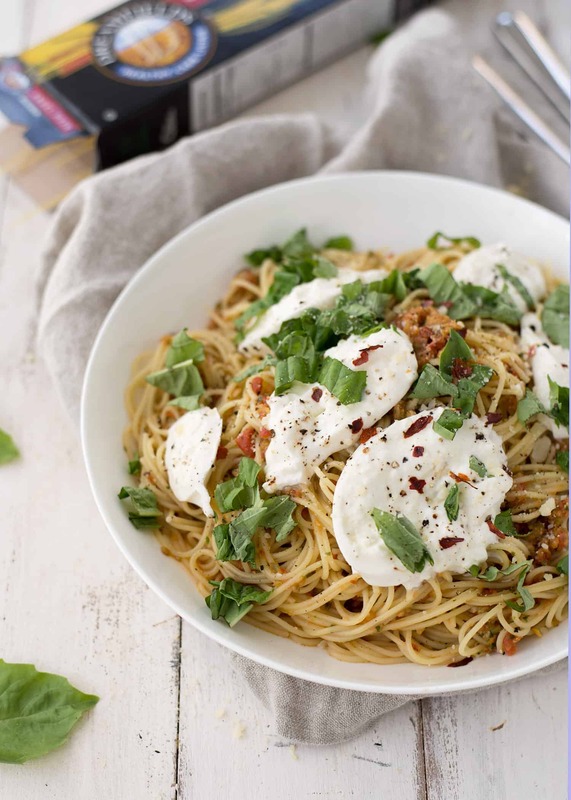 Using Dreamfields pasta is an easy way to make your meals a little bit healthier, especially when covered in burrata cheese. I’m giving away an entire case below, so don’t forget to enter to win. Because the best way to celebrate National Pasta Month is by eating as much pasta as possible, right? 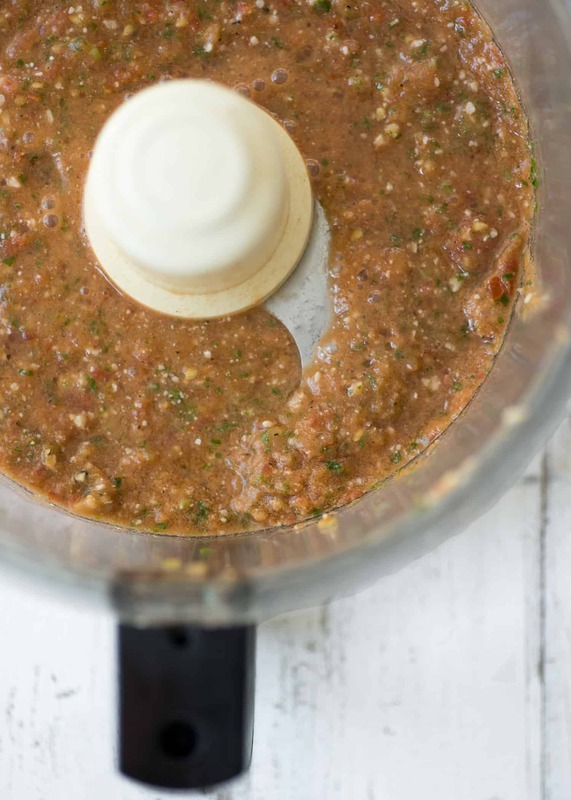 I hope you love this simple sauce as much as I do. If you’re not as fortunate to have an overflowing backyard of fresh tomatoes, try to seek out the most flavorful ones from the market. This time of year, there should still be a few heirlooms lurking around. I do the smell test to pick out the best ‘maters; if I can start to smell them 5-6 inches away, they are perfect. Ok, ready, go! Enter the giveaway for a case of pasta, then go make this recipe. Prepare pasta according to package directions. Reserve 1/2 cup cooking liquid before draining. Place pasta in large bowl. Meanwhile, combine basil leaves, Parmesan cheese, tomatoes, scallions, olive oil and garlic cloves in a food processor. Pulse just until the tomatoes are very coarsely chopped but not pureed. Toss tomato mixture with pasta. If pasta is dry, add cooking liquid a tablespoon at a time to reach desired consistency. Season with salt and pepper, as desired. Transfer pasta to serving platter. Top with dollops of burrata. Garnish with torn basil leave, if desired. Serve immediately. The Red Sauce with Clams looks good. But I’m also a sucker for anything cheesy, so I’d try the pasta checca, too! Spicy Sausage Tuscan Pasta sounds so yummy, I want to try that one!! !